Search and adopt a Poodle near you. Poodles are intelligent, alert, and active. The Poodle is regarded as one of the most intelligent breeds of dog. 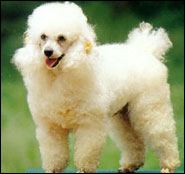 The poodle breed is found in small, medium, and large sizes, and in many coat colors. Originally bred as a type of water dog, the poodle is skillful in many dog sports, including agility, obedience, tracking, and even herding. The Poodle ranks 2nd being one of the brightest dogs ranked by obedience command trainability. Poodles are extremely people-oriented dogs and generally eager to please with a keen sense for instinctual behavior. In particular, marking and hunting drives are more readily observable than in most other breeds. Even Toys will point birds. Classified as highly energetic, poodles can also get bored fairly easily and have been known to get creative about finding mischief. Historically, their aptitude has made them ideal for performing in circuses across the globe for centuries. They are excellent watchdogs, but unlike some working breeds, don't usually become "one-person" dogs when they are part of a family. Standard Poodles in particular tend to be good with children. Poodles are adaptable and easy to train. Like most dogs, they appreciate daily exercise, such as a walk or a play session. Most are fairly agile and athletic. Toy Poodles will play ball and love to fetch. Play time is vital, but one must be sure that they get plenty of rest following long play periods and that fresh water is available at all times. Potty training can be difficult in many dog breeds, but the poodle is one of the easiest to train. Whether going outside or being trained on a pad, they learn quickly where to relieve themselves. However, they are still animals, and they need time to understand what is desired of them. It may take a while, but poodles are quite smart and learn more quickly than most dogs.